With this conviction, Stefan built his first prototype during his apprenticeship. Through the years, he has gradually refined the construction to produce what is today a superbly sounding acoustic instrument with an excellent amplified jazz guitar voice. A major reason these guitars sound so good acoustically is, without doubt, the use of 60-year old, workshop-seasoned, tone woods, such as hand-carved tops of European Alp spruce and solid backs and sides of superior quality German figure flamed maple. 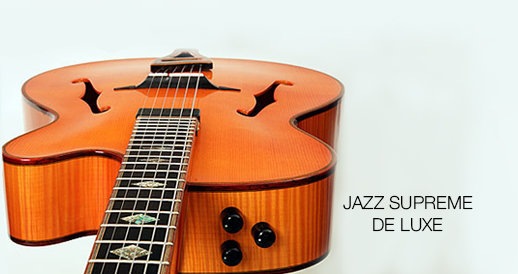 The classic jazz guitar sound is achieved by means of the floating humbucker installed at the end of the neck. A second, ceramic pickup mounted in the bridge via a special technique adds an extremely pure, cutting, yet warm and acoustic component. Both pickups adjust individually and can be blended together for a diverse selection of sound character options, from warm and jazzy to brilliant and acoustic. The double pickup configuration is also available as stereo system with one channel for the humbucker and the other channel for the acoustic pickup. 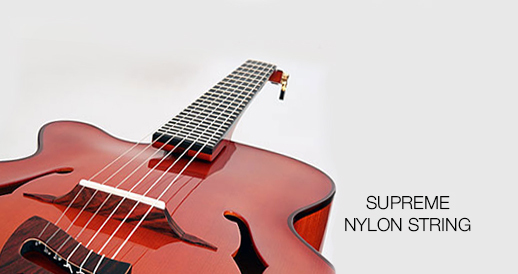 Their above-average unplugged volume gives these guitars the power to stand out in acoustic ensemble playing. 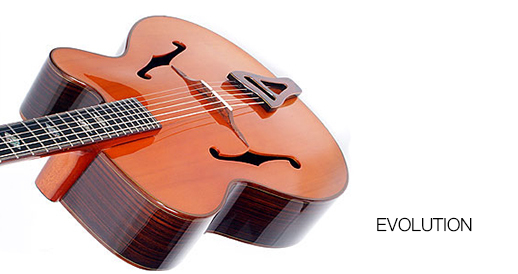 Thanks to the nearly unlimited variety of tonal options, the guitars are extremely versatile.